Bed pans are strong, solid and contoured for patient comfort. Fracture style bed pan has tapered end for improved comfort and placement ease with immobile patients. Plastic guard prevents spills and built-in handles simplify placement and removal. Polypropylene. Mauve. Bulk packaging. What is the difference between H102-10 and H120-10? According to the manufacturer, item H120-10 has a capacity of two quarts, or 64 ounces. The H102-10 holds 34 ounces, or just over a quart. 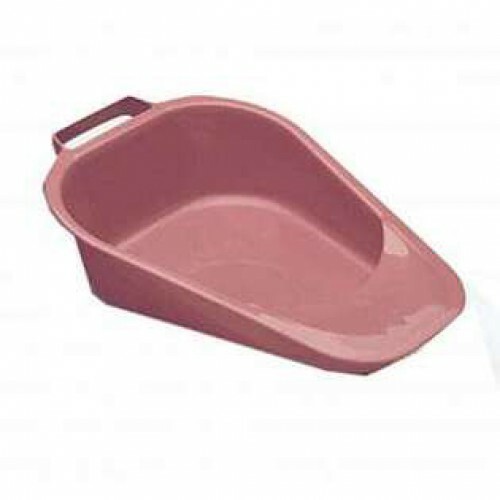 Could this pontoon style bedpan be discretely used in the front seat of a car, say in a parking lot or somewhere on the road when I can't make it to a bathroom? I am female. Please respond at **Email removed by Moderator** Thank you. I thought the pans would be bigger, but they are child sized...cannot use them. No one will be willing to clean the bed pans or plastic containers which are used to accumulate the body fluids or human excrement. The shape of this bed pans is so comfortable which has side grips for easy handling. It was easy for me to use and you will also find convenient to utilize this plastic bed pans. Thanks Vitality Medical for the great price! !